« RM50 Service Tax for Card Holders | Cancel your Credit Card Now! THE Government under Budget 2010, the Real Property Gains Tax (RPGT) of Five Per Cent (5%) would be imposed from Jan 1 on gains from the disposal of real property irrespective of the holding period and category of owner. Malaysia scrapped a three-decade old capital gains tax on property in April 2007 in a bid to help clear a backlog of unsold homes, to give the property sector a boost , attract overseas funds and increasing domestic and foreign demand in the local property market. The re-imposition of RPGT may stir fears of more RPGT increases in future years, which could have a compounding dampening effect on the property market sentiment and and may deter speculative activities to a certain extent. This may also hint that Bank Negara Malaysia will be keeping low interest rates for few couple of months. Low rates also means there would be huge liquidity in the financial system which would boost lending to business and created more jobs. Without the RPGT, the low rates lending maybe used to push or speculate the property prices high up.
? Disposal of a residential property once in a lifetime. KUALA LUMPUR: The Real Estate and Housing Developers’ Association Malaysia (Rehda) is concerned about the re-imposition of the Real Property Gains Tax at 5% for disposal of real property effective next year. Its president, Datuk Ng Seing Liong said such an imposition is counter productive to the efforts to stimulate the property market, especially in the current global economy. “It will also discourage foreign investment in the property sector,” he said in a statement on Oct 23. 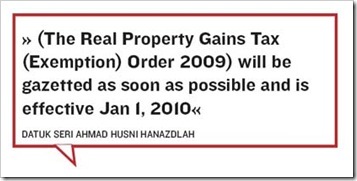 The re-imposition of the Real Property Gains Tax was announced by the Prime Minister Datuk Seri Najib Tun Razak in Budget 2010 on Oct 23. Currently, gains from the disposal of real property are subject to tax under the Real Property Gains Tax Act 1976 to curb speculative activities in the property market. The rates of real property gains tax are progressive from 0% to 30%, depending on the holding period of the real property. 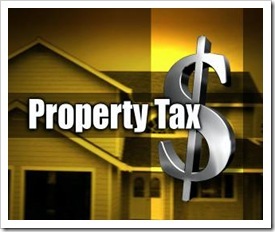 However, real property gains tax was put on hold from April 1, 2007. However, the association welcomes the various incentives and measures announced in Budget 2010 to further promote home ownership. Among measures announced is the provision of another 74,000 low-cost houses for rental in 2010 by the National Housing Department (JPN). On the efforts to promote construction of green buildings, Ng said the incentives to producers or suppliers will help keep costs of such features low and encourage more developers to embark on green developments. “Rehda also lauds the immediate steps taken by the local authorities to facilitate registration of businesses and expedite the issuance of Development Orders in an effort to provide a conducive and friendly business environment,” he said. He added that the allocation of RM3.7 billion to prevent crime would help to project a good image of the country and thus attract more foreign investors. Ng also said that the reduction of the individual income tax rate to 26% and personal relief increase to RM9,000 would provide higher disposable income to the public. He said the move is expected to increase their spending power, which in turn will provide a positive impact to the housing industry. Thinkproperty.my has reported an unusually high number of new listings after the 2010 Budget announcement as well as a high number of price cuts for properties on sale. The reintroduction of a real property gains tax (RPGT) from January 1 next year appears to have triggered a rush to sell properties but agents said it will be very tough to beat the deadline. Thinkproperty.my, a website that lets people advertise their properties for free, said it has seen an unusually high number of new listings after the 2010 Budget announcement. There have also been a high number of price cuts for existing properties that are on sale. However, it did not provide detailed numbers. Last Friday, Prime Minister Datuk Seri Najib Razak said the RPGT will return next year at 5 per cent after it was scrapped in 2007. But agents think it is just a knee-jerk reaction. Property consultant Sharizal Supian said a property deal takes between three and six months to complete, which means it will be very hard to beat the January 1 deadline. The RPGT has not been well-received as many think it would halt the growth of the property market. 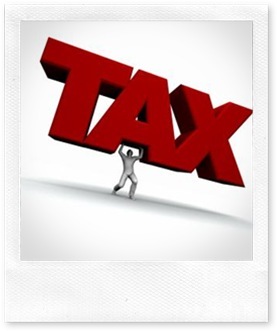 Thinkproperty.my chief executive officer Asim Qureshi believes the re-introduction of the tax has been a year or two too soon. "We need some of the feel good factor to gain momentum and this tax can only slow down that momentum. "Furthermore, I believe that having a tax exemption for property owned for a certain number of years would be better as the tax would target property speculators," he said in a statement. Asim said Malaysia is increasingly seen as an international property hot spot and the RPGT will somewhat undermine that view. However, he thinks that at 5 per cent, the reintroduction has been gentle and it may not significantly disrupt the market. "In terms of opportunity, it will be a good time to buy in the secondary market from now until year-end which is where the tax will have its most direct impact," he said. Emkay Group chief oper ating officer Peter Teh has a different take. He thinks that any sudden surge in sales in the next few months would be mainly due to a recovering property market. He said the tax will not deter serious home buyers. "They are also not really buying now but over a few years and they will not fell the pinch as it will pass through in the next coming years." Property stocks took a beating yesterday as the property tax was "a negative surprise" to investors, analysts said. IJM Land Bhd, the country’s fifth biggest property developer, fell 2 per cent to RM2.44, while Sunrise Bhd slid 4.6 per cent to RM2.28. Eastern & Oriental Bhd shed 6.5 per cent to RM1.15. This entry was posted on Wednesday, October 28th, 2009 at 12:27 am	and is filed under property. You can follow any responses to this entry through the RSS 2.0 feed. Both comments and pings are currently closed. This announcement is a real shock to most of the property developers and real estate investors indeed. With this announcement, most of the sellers would try to sell their property by end fof this year to safeguard their profit. Starting from next year onwards, property market may get slow, buyers would have more time to wait and see how the market is going on. House prices up 20pc in 2010? House hunters will likely face higher prices next year as pent up demand and gains from the stock market boost the property sector. Houses on the secondary market could also be hit by an additional five per cent increase in prices as owners looking to sell try to cover the real property gains tax (RPGT) which comes into effect in January. According to the Real Estate and Housing Developers Association (Rehda), slightly over half the respondents in a survey of its members expect property prices to increase up to 20 per cent over the next six months. About 30 per cent of the respondents expect prices to remain stable, while less than five per cent expect prices to decrease. The stock market has made substantial gains this year and investors who benefitted will likely be looking to put their money in property. Six to nine months after the stock market increases, it goes into brick and mortar, said Rehda deputy president Datuk Michael Yam at a briefing today on the property outlook for next year. On the positive side, interest rates remain low and banks continue to be flush with extra funds, therefore making the arrangement of home financing easier. Yam, however, stressed that there was still a relatively low barrier to home ownership in Malaysia and ticked off a list of factors in the homebuyers favour, including interest rates as low as BLR (base lending rate) minus 2.3 per cent; margins of financing up to 100 per cent; zero lock in period; stamp duty exemptions; and repayment periods extended to thirty years or up to the age of 75. Even I can qualify for a (30 year) loan now, he quipped. According to Rehda officials at the press conference, the average value of homes transacted in 2009 is estimated to be between RM200,000 and RM250,000 when excluding low cost homes, and about RM168,000 when taking into account low cost houses. Fresh graduates, however, could face difficulty buying properties in the city where prices are much higher. Yam said that there were no official figures available for the average price of link homes in the Klang Valley but said that there were terrace houses in some suburbs available for about RM400,000, as compared with RM200,000 in smaller towns and cities like Kluang and Kuantan. Graduates may have a problem without help from their parents, he said. They earn maybe RM3,000 to RM4,000 a month, which means they can borrow only RM150,000 to RM200,000. It is not possible to buy a terrace house [with that level of income] but maybe an apartment. He added that developers might have to consider building smaller units for the fresh graduate market segment, in the region of 600 sq ft apartments that sell for RM300 per sq ft.
A long term boom is also expected for the housing industry that could put upward pressure on prices as Yam said that slightly over half of the population is below 24 years of age and would later enter the homebuyers market. These people will be pushing to enter the property market, said Yam. Housing prices in some parts of the world such as China, Singapore, Hong Kong and Australia have risen dramatically over the two years, prompting a public outcry. Prices of private homes in Singapore reportedly rose by 16 per cent in the third quarter and there are concerns of a speculative asset bubble building in Hong Kong. According to Ratings Agency Malaysia economist Kristina Fong, asset bubbles were not evident in Malaysia and an over-supply of units on the Malaysian property market is likely to cap price escalation. We are a legal firm dealing in property transactions daily . Our beloved Prime Minister mentioned last year that there will be no Property Gain Tax imposed AFTER 5 YEARS . 2. SOLD IT IN 2009 BUT THE SALE REQUIRES STATE CONSENT. QUESTION: THE SELLER BOUGHT HOUSE IN 1993 THEN SOLD IT IN 2009 .
iT IS PAST 5 YEARS ALREADY. Please confirm with IRB on the above matter. i intend to sell my property through agent, bought in march 2004, mean past 5 year, do i need to pay for government tax to the agency?